Turtle Rock says Evolve might implement support for mods post-launch but it won't be there out of the gate. The best online shooters, or at least the most durable, tend to be those that support mods. Mods allow creative (or bored) fans the opportunity to change up the game, making it into something different - and often, something better. Some mods are simple while others are complete overhauls, and the odds are pretty good that if you've spent any meaningful amount of time shooting at other people online, you've got your favorites. 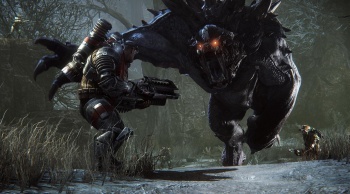 But when Turtle Rock unleashes Evolve on the world later this year, it will do so without mod support. "We're not against it," studio co-founder Phil Robb told Rock, Paper, Shotgun. "I'm a big fan of that kind of stuff. I mean, if it ends up coming to be, then that's awesome. But we're still very much in development. I don't think we have anything concrete yet." It's not exactly the most unambiguous answer to a question I've ever heard, but when Robb was pressed about whether that meant mods won't be considered until after launch, he said, "Probably, yeah." As RPS pointed out, Turtle Rock has been successful but it's not a huge studio, and it's developing the game for both next-gen consoles and the PC on its own, which is a pretty heavily workload. But while Evolve will offer multiple player classes and alternate modes of play, the basic underlying game seems pretty narrowly focused, and that could prove problematic in the long run. Turtle Rock announced yesterday that Evolve will launch on October 21 for the Xbox One, PlayStation 4 and PC.